Darbying or bull floating should be done immediately after "screeding", or after the concrete has been tamped if tamping was done.This process should be finished before excess moisture or bleedwater appear on the surface. The purpose of darbying or bull floating concrete is to level ridges and fill voids left by the screeding operation. It should also slightly embed the coarse aggregate to make subsequent finishing operations easier. Be careful when using these tools not to close up or seal the surface of the concrete, which may cause blistering or scaling. Use a bull float for areas too large to reach with a darby, though it may produce a wavier surface. Purpose: To level ridges, fill voids, and smooth the surface in preparation for troweling. Floats also can be used to work in dry-shake color hardener. Unlike trowel finishing, floating won't close the surface, which is important at this stage to permit water to bleed out. A float also helps bring paste to the surface by pushing down the coarse aggregate. What's available: The most common floats for decorative concrete work are made of magnesium, aluminum, or wood. Less common float materials include stainless steel, rubber, and laminated wood or canvas resin. Bull floats are used to work large areas of concrete and are typically 8 inches in width and 3 to 10 feet in length. Hand floats range in width from 3 to 5 inches and in length from 12 to 24 inches. Most floats are available with rounded or square ends. Round-end floats work more easily in tight corners and help to minimize lap marks. Watch Bob Harris demonstrate the use of various hand floats and darbies. Watch Bob Harris demonstrate the use of various bull floats, including wood and magnesium floats. Look for magnesium bull floats with top reinforcement ribbing, which adds strength and prevents distortion. You'll need to purchase bull float handles separately. They are typically offered in aluminum, magnesium, or fiberglass in 4- to 10-foot lengths, and often can be interlocked to create longer lengths. Buy fiberglass handles if you plan to work in areas with overhead power lines, because fiberglass won't conduct electricity. Not all bull floats come with bracket assemblies for attaching handles, so you may need to purchase those separately as well. For better control, buy an adjustable tilt-action bracket that lets you change the float pitch with a simple turn of the handle. On hand floats, look for handles that are screwed to the blade so the handle can be replaced if it splits or breaks. The handle also should be positioned for good balance, allow adequate knuckle clearance, and have a comfortable grip. 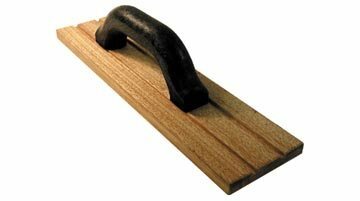 Wood hand floats are available in variety of types, including teakwood, bodark wood, and redwood. Each type may produce a different surface texture, so it's always wise to experiment. Rubber floats are good choices for producing textured or slip-resistant finishes because they bring more sand to the surface. Average costs: You'll pay about $100 to $125 for a 4-foot magnesium bull float with bracket, and $18 for a 14-inch magnesium hand float. The price of wood floats varies, depending on the type of wood used, but will generally be lower than the cost of magnesium. Floating should be done after the edging and jointing operations. Floating helps remove imperfections and produces a flatter surface. It also compacts the slab and the mortar at the surface in preparation for later finishing operations. Floating can be performed by machine or by hand. If floating is done by hand, a magnesium float is recommended, particularly on air entrained or lightweight concrete. "The Hog" Hand float Made with magnesium. Covers wide surface area. 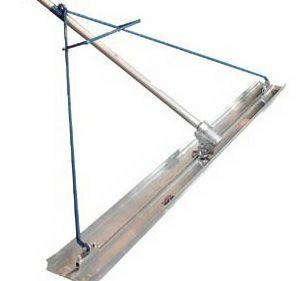 Kraft Concrete Float 24" x 3.25" Lightweight magnesium float for small areas of concrete. Kraft Tool Magnesium Darby Comes in 42-inch and 48-inch options.